It's that time of year that pontoon boat lovers in certain parts of the country hate: the end of warm weather and time to prepare their boat for winter storage. Though it may not be a fun process, it's essential to properly prepare your boat for storage so that it will be ready to go in the spring. Here are the five steps you need to take to prepare your boat for seasonal dry storage. 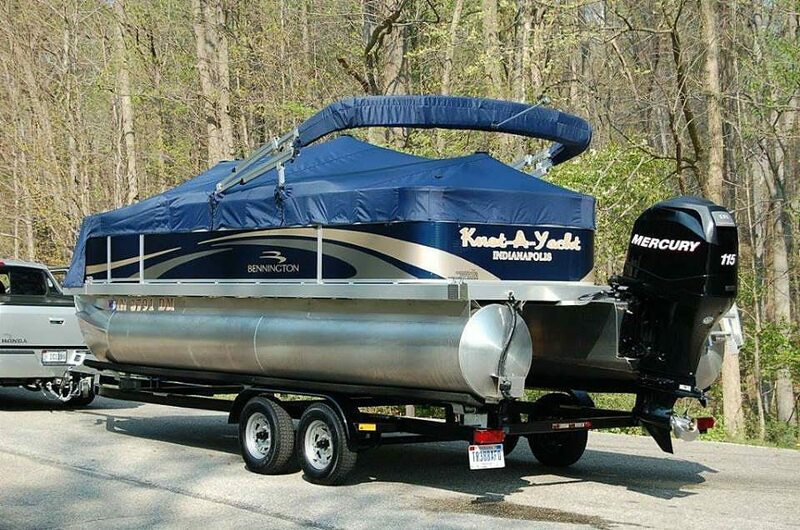 Secure your boat onto a trailer and haul it to its winter home. If the boat has been in the water with a mooring cover in place, remove it before you drive off. Many people rent a storage space for their boat over the winter if they want to keep it indoors or don't have sufficient room at home. Though it's ideal to store your boat indoors, you can keep it outside as long as you cover it and take other precautions against damage as described below. When air inside your fuel tank gets cold, it will condense -- i.e., turn to water. That's bad for two reasons. First, of course, you don't want water in your gasoline. Second, you don't want water on the inside surface of the tank, where it will cause rust to form. To force air out of the tank, fill it with fuel to within one inch of the tank filler hose. Add a fuel stabilizer. Used engine oil contains contaminants that you want to remove from the engine before they settle on critical metal surfaces such as bearings and cams. After filling the gas tank, drain the engine oil then remove spark plug wires and plugs. Spray a fogging oil through the spark plug holes in the head, put in fresh oil, and install new spark plugs. Disconnect the battery cables. Clean your pontoon boat thoroughly of the season's grime, mold, algae, and salt. Remove all loose gear and supplies, especially food and drink; wipe down the upholstery; vacuum the carpet, and put rodent poison on the deck to deter critters and protect your upholstery. Keep the pontoons off the ground to prevent corrosion. Place blocks under the welds of the pontoons, or store the boat on its trailer. If you're storing it outdoors, cover it with a tarp or shrink-wrap. Build a tarp frame from cheap lumber or PVC pipe so that the tarp will shed water, snow and ice. The use of a mooring cover is not recommended for winter storage, since it's not designed to support a snow load. When you store your boat properly for the winter, you will keep it safe from damage and deterioration and be ready to go when next boating season arrives. If you would like more information on Bennington pontoon boats, please check out our website!